The Buffer Technologies PPSh-41 recoil buffer will fit on all original models as well as the new semi-auto version now being produced. The recoil buffer simply replaces the existing buffer, but the difference is that our buffer is made of a polyurethane material which can take thousands of rounds without breaking down or coming apart like the original. 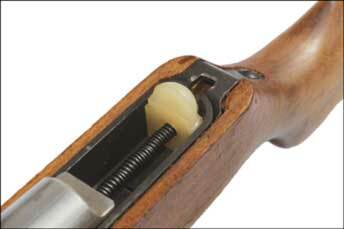 This 21st Century material replaces 1940's technology, which was all that was available when the gun was designed. Since the original buffer was very hard the impact from the bolt was transferred into the receiver, but not with the replacement buffer! You will experience reduced felt recoil and better muzzle control, all this while lengthening the service life of the weapon.